Synthetic bristles: Unlike the brush sets, the single brushes come in plastic packaging instead of pouches. (The Real Techniques brush sets usually come in a “panoramic brush case and stand”). The bristles are made of synthetic taklon fibers that are hand-cut to precision. Taklon is known to have anti-bacterial properties and is a good choice if you are looking for cruelty-free makeup brushes that are soft and versatile as well as durable. Natural Hair vs. Synthetic Bristles: Being made of synthetic fibers, the bristles don’t trap as much product like their often non-cruelty-free natural hair counterparts. Generally speaking, due to the structure of the bristles you would use natural hair brushes for powdered products, such as powder eyeshadow, bronzer and blush and synthetic brushes made of taklon for creamy and liquid products, i.e. foundation, concealer, cream eyeshadows. Versatility: Fortunately nowadays, the newer generation of taklon brushes such as the ones from Real Techniques are so soft and versatile that you can use them for both cream and powder products. The doubled-ended brush that comes with Urban Decay’s Naked Palettes for example, is made of synthetic taklon and used for their powder eyeshadows. A side note: Honestly, I don’t see the need to test on animals for cosmetics, so I am trying to built a makeup kit that is based on cruelty-free products and if possible, contains no animal by-products. I do admit though, that I own a few natural hair brushes that I still use. These are either brushes I’ve had for a long time (for over 10 years or so) or newer ones that came in a bare minerals set for example. Bare Escentuals (the company that makes bare minerals makeup) states on their website, that the natural hair bristles are made from pony and goat hair without any harm being done to the animals*. So, I can only assume they shave them? I wonder, how the animals are being handled while being shaved because often the workers who shave sheep for example, are being paid by number. A lot of makeup companies market their natural hair brushes as cruelty-free but how do they do it with brushes that are made of squirrel or sable hair? Do they shave them too?! I am very suspicious about this. I was quite surprised and disappointed to find out that many brands that were well-known to be cruelty-free over here in America and Europe have been taken off the list. The reason for that is their expanding into the Chinese market. The design: The handles of the Real Techniques synthetic brushes are made of light-weight aluminum. They are shaped in a way so that they can be stored in an upright position which works fine. The end of the handle is made of plastic for support and balance. The brush is light overall and the handle is long enough to comfortably fit in your hand. The ferrule (the metal band in which the bristles are glued together and that basically attaches the bristles to the handle), is tightly glued to the handle and keeps the dense bristles in place. I have washed this brush about 10 times now and have yet to experience any shedding or loosening of the ferrule (with cheap brushes often the glue inside the ferrule dissolves with washing and the latter will become loose). Although a lot of the brushes are meant to be multi-purpose, the handles come in a color-coded system to help follow the steps of makeup application (gold=base; purple=eyes; pink=finishing touches). Since I just bought the Expert Face Brush recently, I can’t give an honest opinion on the durability yet. But so far, there is no shedding of the bristles and the overall quality seems good. All the parts have been assembled in a way that makes the handle feel smooth and balanced in your hand. The bristles themselves feel soft and are very dense on the Expert Face Brush. It allows you to pick up cream and liquid products with the tips of the bristles without soaking them. So you use less product overall which makes it buildable from sheer to full coverage. The shape of the bristles is ideal to buff the product into larger areas like the cheeks and forehead but also makes it easy to get in the corners around your nose. Especially for around the nose I like the size of the brush. It all depends on your individual face – if you have a small face, smaller brushes are easier to work with and vice versa. The dome shape of the brush also makes dabbing cream foundations on selected areas easy. Think of a stippling technique here. Instead of buffing the product into the skin and moving it around, you can also use the brush to dab another thin layer on for the “air brushed” effect without making it look cakey. The latter technique is much more appropriate for dry and sensitive skin types. Smooth and balanced handle fits comfortably in your hand (good size). Color-coded system to follow the steps of makeup application. Printed name on the handle, not just a number (which makes it easier to differentiate them from one another). Overall good quality for a reasonable price. Soft synthetic bristles for both cream and liquid products. Ideal for buffing and dabbing on cream foundations (I haven’t tested it with liquid). Provides a nice buildable finish from sheer to full coverage depending on the technique used. Easily available at Ulta and even some local Walmarts. I wish the Expert Face Brush was a tad heavier just because it is my personal preference to “feel” the tool I am working with. But that is a minor issue and as mentioned, based on personal preference. Have you tried any of the Real Techniques brushes, if so, how did you like them? What are your thoughts on cruelty-free brushes or products in general? I’d be interested in if and why you prefer a certain brush. 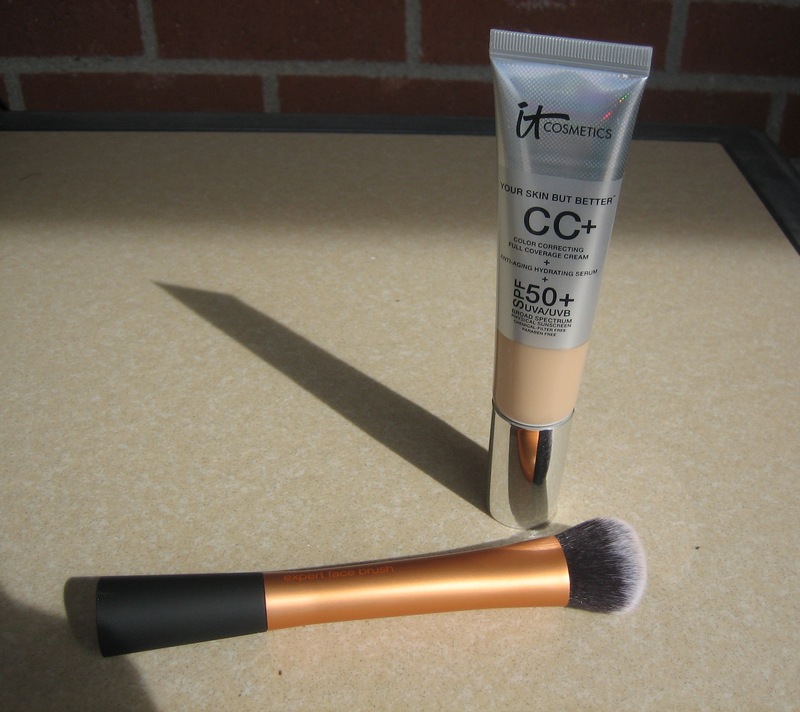 ← Anti-Aging Serum, Sun Protection and Beautiful Skin in One – CC+ Your Skin But Better Cream by IT Cosmetics. Review and Swatches.